Grilled cheese joins s'mores, chili, and hot chocolate as perfect campfire cuisine with the help of this sweet utensil. Made from cast aluminum and stainless steel, the press is sized to hold your sandwich, locks to keep it secure, and even disassembles for easy cleaning. The rosewood handle lends a sophisticated touch. Simply hold over the campfire (or even the gas stove) and enjoy a delectable treat al fresco. Made in China. A member of the Uncommon Goods crew put the Grilled Cheese Maker to the test on a recent camping trip. Read about how it worked out on our blog. Hand wash with mild dish washing soap. Rinse and dry immediately. I bought this as a gift for my husband but this is a product the whole family will benefit from! Makes the perfect grilled cheese. We used it over the stove, not on a grill, but it is grill safe which is very exciting. Easy to clean too. My husband's one complaint is that you can only make one sandwich at a time so it is slow if you are cooking for more than one person. The first time we used it we had a misunderstanding with the instructions, but after that it's a great little addition to our kitchen! My brother uses the grilled cheese maker over the stove top to make grilled cheeses! He also uses the grill, but the stove seems to be more convenient. Not only does the grilled cheese maker give the perfect grill marks, but it keeps the cheese from seeping out the sides, and no one likes spilled cheese- amiright?! You can also make flatbread sandwiches in it, dope! The only thing i'd change is the way it interlocks. if you are making a fatty sandwich, it's hard to lock the two plates together. It'd be nice to have them not separate at the bottom (though this is probably for easy cleaning). Also the latch gets crazy hot, maybe consider making that silicon or something that won't result in lava temperature metal. Overall, love the product- he uses it every day. 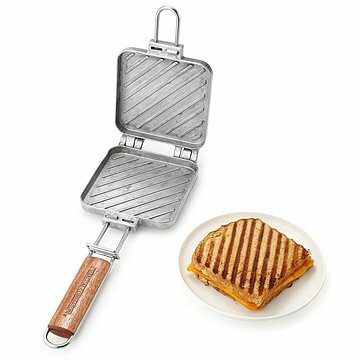 Makes perfect grilled cheese sandwiches quickly and easily. It smelled weird during the first use, but by the second time, it was fine. This could be remedied by washing prior to first use. Made from cast aluminum and stainless steel, this grilled cheese press lets you make the gooey treat over the campfire.